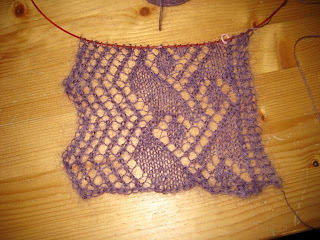 I bought the Victorian Lace Today book and yarn for this project quite a while ago and then got too intimidated to start since I’d never done any lace knitting before so I (wisely, I think) did a few easier lace projects first and now this seems like a piece of cake. It’s the “Scarf with the No. 20 edging” (pg. 84 for those with the book) and I’m knitting it with Alchemy Haiku yarn which is much like Rowan Kidsilk Haze but slightly less expensive (at least at my LYS) and I’m happy to say that it’s actually a bit softer – much less itch factor than the KSH.